Home » GGJ13 What's happening around the world? At 4AM GMT (0) on Saturday 26th of January, about 14000 jammers around the world were simultaneously jamming, tweeting, livestreaming, chatting, animating, laughing, eating, listening to music and... creating! There is so much content out there with screenshots, photos and videos from prototypes, art, programming, playtests and people being silly. 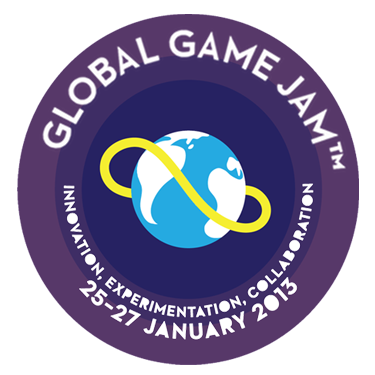 Much of it is shared via twitter, so do check out the Global Game Jam twitter stream and the #ggj13 hashtag. Did you know there are already about 21k tweets shared about Global Game Jam since November? Check out more stats via the Global Game Jam Epilogger page. We are regularly updating our Facebook page with news and links: https://www.facebook.com/GlobalGameJam. The jam truly is a global effort from organizers filled with creativity, which this photo album with GGJ13 posters also shows. Erin Robinson shared her GGJ13 keynote video and some of her comics from the video on her website. At time of writing about 537 games have the word 'heart' in the title.